The earliest history of taijiquan is today still largely a matter of conjecture and the cause of no small amount of inter-style argument. This being the case there seems little point on dwelling too much on it. Sufficient to say that Taiji was undoubtedly influenced by many external martial arts and in part by its close geographical proximity to the Shaolin Temple. When it moved from its mixed internal/external to its purely internal roots is extremely difficult to say with any conviction. The techniques of daoyin (the concentration of chi or qi) and tuna (deep breathing exercises) have been written down from 400 BC being described and championed by such famous Taoist writers as Lao Tsu (Lao Zi) and Chuang Tzu (Zhuang Zi) amongst others. These play an important part in taijiquan and in their modern forms of Chi Kong (Qigong - literally energy or breath exercises) and neigong (literally Internal Exercises). However, despite being a part of taijiquan training, they are not by themselves martial exercises. Of the undisputed history, the earliest authenticated written records are held in Chen village, (Chenjiagou Village, Wen County, Henan Province in North/East central China.) While there are earlier martial arts records, some dating back 3000 years, with elements that are certainly present in modern taijiquan, all the major schools accept that taijiquan in its modern form certainly comes via Chen Wang Ting, (see image to the right) in Chen Village, in the middle of the 17th century, the late Ming Dynasty in China. I say “at least via” because while there is little doubt that Chen Wang Ting created seven sets of movements for training what was then called shadow boxing, (‘taijiquan’ really being a 20th century name,) most of the forms of movements can be traced by name to earlier authors such as Qi Ji Guang (1528-1587), but with no reference to shadow boxing. Before this point too much is still conjecture. Much after this point is still open to argument but records are significantly clearer. Perhaps the main step taken by Chen Wang Ting was to combine fighting skills with internal but non-fighting training to utilise a different type of power. In particular the usage of spiral-like winding and unwinding (opening and closing) movements within this internal framework. Certainly if this was his achievement it was no small one. There are other internal martial arts (including Xingyiquan and Baguaquan) that make exclusive use of these internal aspects and some external martial arts like the Shaolin Boxing and Chinese Monkey Boxing that accidentally or otherwise may make occasional use of peng jing, that have no obvious connection to Chen Wang Ting. However what is clear is that only the Internal Martial Arts aim to use them exclusively. From this probably steps their potential additional health bringing nature. Yang Luchan taught Wu Yuxiang who went to study in Chen Village with Chen Qing Ping in 1852 and created Wu/Hao style taijiquan. His lineage taught Sun Lutang (1861-1932,) who was himself already proficient in Xingyi: he developed Sun style Taiji. 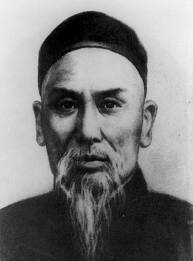 Yang Luchan’s son Yang Ban Hou who in turn taught his relative Wu Jianquan who created Wu style Taiji. These five schools (Chen, Yang, Wu/Hao, Wu and Sun,) are the five most common styles of Taiji today. As time has past more styles have developed and within each school each particular master has had their own particular interests. It should be noted that there are many other schools / styles that claim to train taijiquan. Some of these are simply offshoots of these five styles while some are spurious. For the beginner it is very difficult to ascertain whether someone is a putative student and practitioner of taijiquan or a charlatan. Since the cultural revolution in China in 1956 the Chinese government authorised a synthesised or standardised set of forms (24 forms) which were expanded into the 88 forms (1957) and 48 forms (1979) all of which are principally based on the Yang style. Also since the 1950’s under a famous fighter and teacher Chen Fake, Chen style has become more well known and the two principle old forms (laojia) were adapted into two new form (xinjia) to fit its modern audience.